Gwynne Edwards, Lorca: Living in the Theatre. London and Chicago: Peter Owen, 2003. 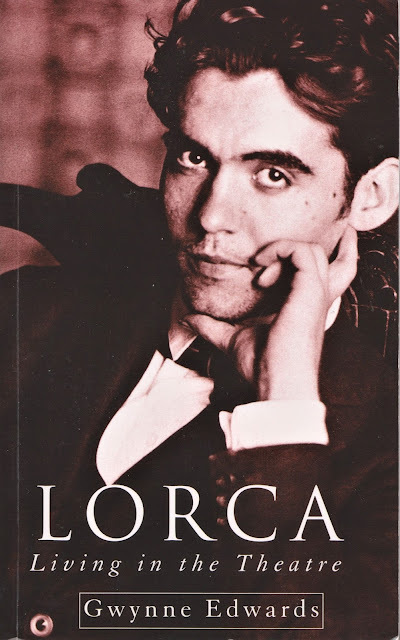 I have found this to be very helpful as a guide to plays by Federico García Lorca (1898-1936), and for a serious delving into Spanish and modern theatre in general. Of course, written plays go back to the ancient Greeks and are a hallmark of literacy. Ancient theatrical performances foreshadow cinema, television, YouTube and God knows what else that's coming in the future. Maybe time travel. The Public was so far ahead of its time that Lorca quipped even then: "This is for the theatre years from now." It was not performed until the 1970s; professionally, not until the 1980s (see pages 42-43 and 55+). Edwards gives a brief overview of Lorca's formative time spent at the Residencia de Estudiantes (pages 44-46), which sounds like an ideal place to soak up and exchange new ideas and energies. World class lecturers came through (from Albert Einstein to H. G. Wells) and fellow students included the likes of Luis Buñuel (1900-1983) and Salvador Dalí (1904-1989). Edwards thereby discusses Lorca's "magpie approach in all his work" (page 47) -- meaning he drew from eclectic sources and styles, including Surrealism and Classical Theatre, visual art, dance, Gypsy and Arabic music and poetry, cinema and Catholicism. He was on fire!